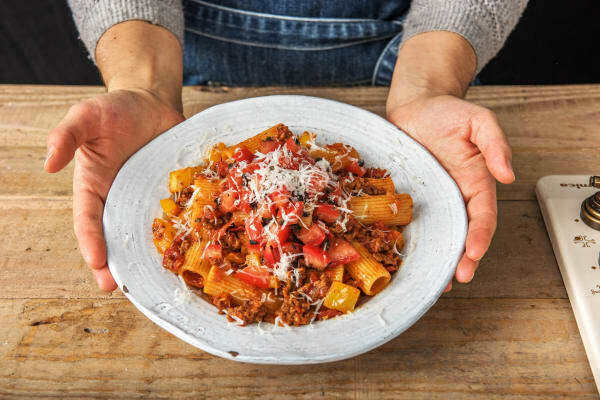 'Al dente' is one of those phrases people throw around a lot when talking about pasta, but what does it actually mean? The Italian translates as 'to the tooth' and pasta cooked perfectly 'al dente' should retain a little bit of firmness. The way to tell is by biting through a piece. Have a nibble before you serve up and if you can see a tiny bit of white in the middle of the cooked pasta, then it's spot on and time to tuck in! 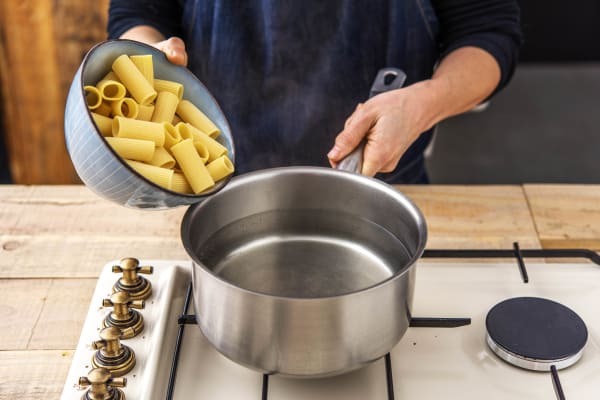 Put a large saucepan of water with a generous pinch of salt on to boil for the pasta. Halve, peel and chop the onion into roughly 1⁄2cm pieces. Peel and grate the garlic (or use a garlic press). 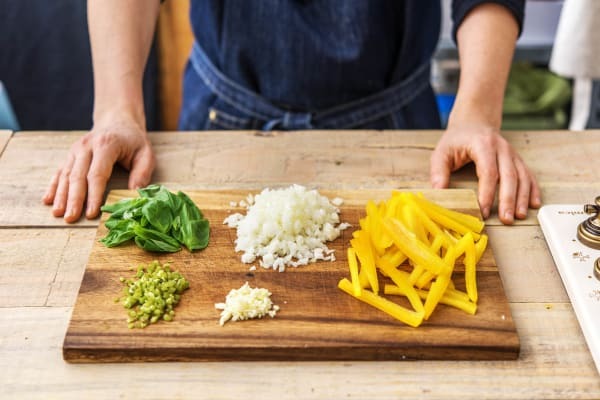 Halve, then remove the core from the yellow pepper and cut into 1⁄2cm slices. Pop your kettle on to boil. Heat a splash of oil in a frying pan on high heat. 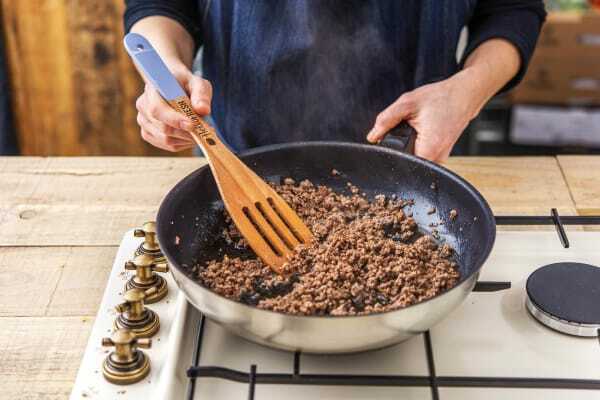 When the oil is hot, add the beef mince and use a wooden spoon to break it up as it cooks. Cook until nicely browned, 5 mins. Season with a pinch of salt and pepper. Add the onion and yellow pepper. Cook until soft, 5-7 mins. Stir in the garlic, dried thyme and tomato purée. Cook for 1 minute more. Add the finely chopped tomatoes. Pour the boiling water (see ingredients for amount) into the pan along with the stock powder. Stir to dissolve the stock pot. Bring the ragu to the boil, then lower the heat. Leave to simmer for 20 mins. The ragu will reduce and thicken in this time. Meanwhile, add the rigatoni to your pan of boiling water. Cook for 11 mins or until 'al dente'. TIP: 'Al dente' simply means the pasta is cooked through but has a tiny bit of firmness left in the middle. While the pasta is cooking, make the salsa. 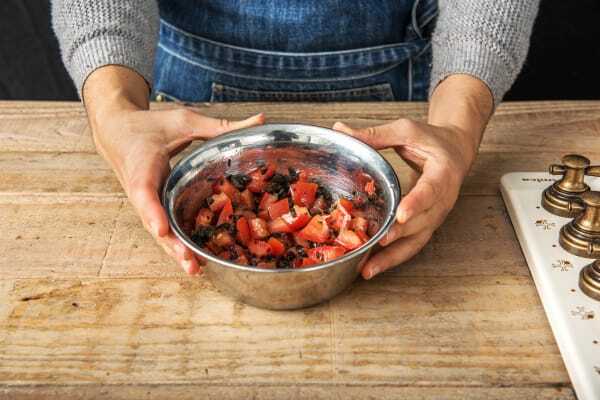 Finely chop the black olives and chop the vine tomato into 1⁄2cm cubes. Pop them in a mixing bowl with the olive oil (see ingredients for amount). When the pasta is cooked, drain in a colander (reserve a splash of the cooking water). 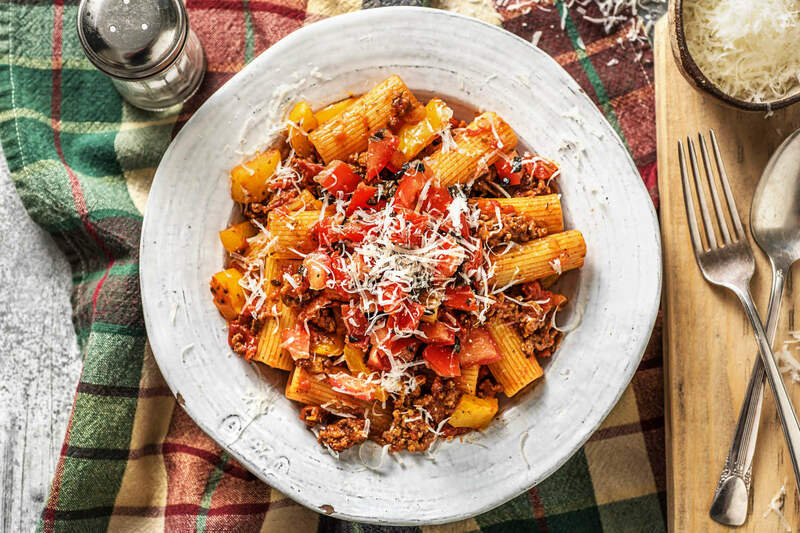 Taste the ragu and season with more salt and pepper if necessary. 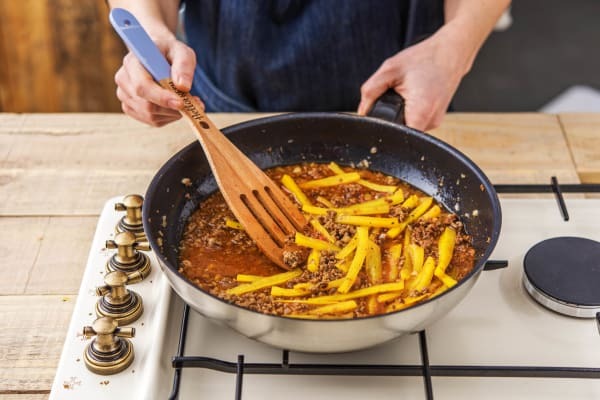 Combine with the pasta and mix well (add a little of the cooking water if you think it looks too dry). Serve in deep bowls, topped with the salsa and sprinkled with the hard Italian cheese. Buon appetito!